The Hive – The Women of 29th Street Rep: A reinvention of the award-winning Off Broadway theater company originally established in 1988. The Hive invites and provides artists with an environment of networking and resources for boundary breaking projects in all mediums. In April of 1988, after several informal gatherings amongst actor friends and peers, all like-minded in their desire to start a theater company, 29th Street Rep was officially founded by three women - Mallory Morris, Paula Ewin and Linda June Larson and two men, Tim Corcoran and Leo Farley. As Founding Members, we five, along with ten associate members, began our mission of producing plays in the tradition of the actor/managers of the 19th Century….i.e. “We do everything!!”. After 20 years and 80 productions, 29th Street Rep has earned a reputation for some of the best theater Off and Off Off Broadway. Since losing our intimate theater space on 29th Street in Manhattan in June of 2008, the repertory company has had to adapt to change. 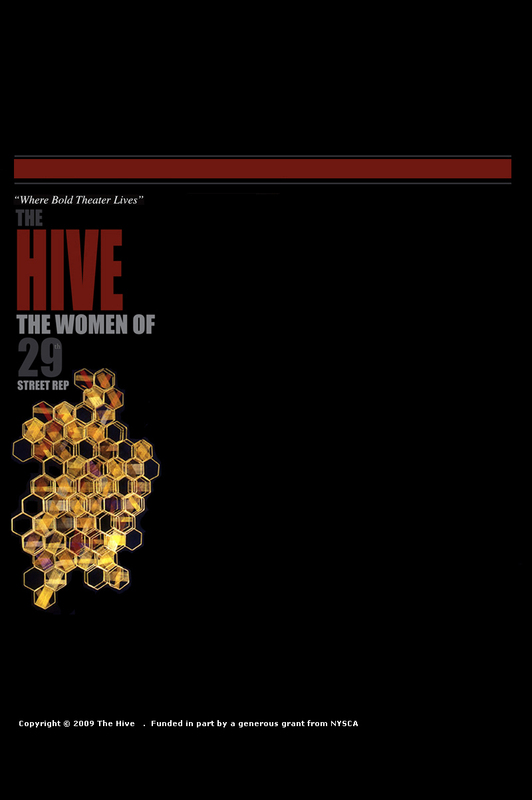 The Hive – The Women of 29th Street Rep, is a testimony to the variant talents displayed and contributions made by the numerous women who wove their own unique thread into the fabric of our theater. Their efforts, along with those of the technical and supporting staff, were tantamount to the success of the Rep. It is a fact that over the years the repertoire of characters and the issues of many of the plays produced featured complex women in often uncompromising situations. However, the plight of these individuals most often revealed the strength and tenacity shared by most women, born out of the circumstances of being a woman in a world often controlled by men. Together and apart, on and offstage, there are further adjectives which aptly describe the vibrancy and compelling work of The Women of 29th Street Rep – beautiful, brave and most certainly, bold! The Hive website both honors and acknowledges the contributions made by these women and will serve as a continuum for networking and support going forward. Films, music, plays, poetry and even puppetry – these are some of the fascinating projects the women are engaged in now. Stay in touch here at www.hiveat29th.com for all the latest from The Hive - The Women of 29th Street Rep.